Is PowWeb a good web host? Read our complete review on PowWeb web hosting here! - Special Promotion: US$3.88 per month now! PowWeb Inc, is a privately owned California web site hosting company that has been in business for more than 10 years now. 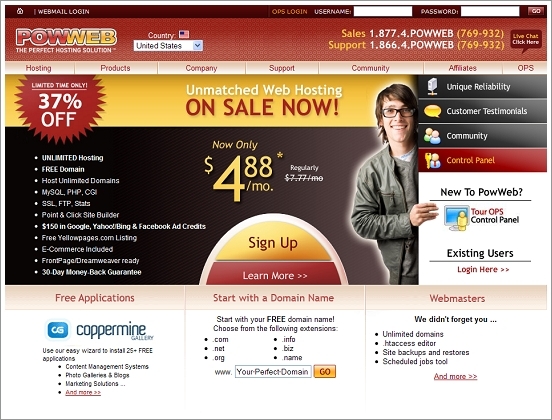 Since PowWeb was founded in 1999, it has established itself as a leader in the lowest price web hosting industry sector. Unlike many web hosting companies offer many different hosting options, PowWeb focuses only on a single hosting plan, One-Plan Package. By concentrating only one web hosting package, PowWeb is able to cut down its overhead costs and pass the savings directly to you. Today, PowWeb has more than 500,000 satisfied customers from around the world. As a member of the Better Business Bureau, you can expect PowWeb to meet the Bureau's ethical business practices and to provide high-quality web hosting at an affordable price. If you order their one year prepay plan at $7.77/month (Special offer: Only $3.88/month now), you get 1 year free domain name. PowWeb constantly upgrade and improve its service features. The most recent improvement offers unlimited diskspace and bandwidth. However, the restriction is that the website cannot exceed the ceiling of 500,000 hits per day. PowWeb has imposed this limitation with the objective to improve overall server performance to all their customers. Moreover, PowWeb also enforces a maximum of 50,000 files that you can upload to the server which makes PowWeb the only web hosting provider that has such 'weird' restriction! Nevertheless, we believe few websites will ever hit such limitation. e-Commerce Ready - PowWeb's One-Plan Package is e-commerce ready. It supports built-in osCommerce (Open Source e-Commerce) shopping cart, PayPal and shared Secure Sockets Layer (SSL) secure certificate for online payment. Here is a sample osCommerce liveshop. PowerWebBuilder Basic - PowerWebBuilder is a free and an easy-to-use tool provided by PowWeb for creating a web site from scratch. Whether you are a novice or an experienced web developer, you can create the site you want and manage and maintain it with ease. And best of all you have the flexibility to add powerful functionality when you are ready. PowerWebBuilder is browser based, so you do not need to install any programs or software. You can add commerce, marketing campaigns, and other upgrades to PowerWebBuilder easily as your online business grows. Control Panel - PowWeb supports a custom control panel called Member Operations Center (OPS). One of the downside of a custom control panel is that you probably have to spend more times to learn the OPS in order to configure your website. For instance, we had problems in setting up the email accounts using OPS as it is quite different from other more common control panel such as Plesk or CPanel. Another problem with OPS is the website configuration functionalities are not properly organized. As a result, it is difficult to find the functions that you want. For example, if you wish to add mySQL onto your website, you have go to a section under 'Billing/Plan' to find it! Nevertheless, their technical support staffs are always available and very helpful to solve such problems for you. Another good news is that PowWeb is currently developing the next version of OPS control panel driven by the latest in XML and server-side technology. The beta version of the new OPS control panel has better functionality grouping and great improvement on usability with direct-access graphic layout that aim to fix the current control panel problems. Marketing & Promotion - The marketing and promotion utilities provided by PowWeb are quite comparable to IPOWER. They supply "Popularity Checker" tool where you can check different search engines to see how many websites link back to your site. A "Meta Tag Generator" tool to generate a group of meta tags to assist you to create search engine optimized web pages. Plus, search engine submission tool to get your website listed on several popular search engines with only one click. Finally, you will also get $50 free Overture Credit to drive targeted traffic to your website through Pay-Per-Click marketing. PowWeb provides a complete customer support solutions to their customers. Toll-Free Phone - PowWeb provides toll-free telephone support at their main line: 1-877-4-POWWEB (1-877-476-9932) for customers in US & Canada. However, the toll-free support only offers during normal business hours (Pacific Standard Time). For International customers, you can reach PowWeb at non toll-free number: 310-278-8926. 24/7 Email support - PowWeb provides 24/7 Email support covers billing, sales and technical support. When you email their technical support, you will receive an autoreply with a tracking code number which can be used to track the status of your email and even how long it's been in the queue. Once, we had POP3 email setup problem. Their technical support suggested various solutions and followed up on the problem continuously. In the end, they managed to fix the problem and we were impressed with their technical support. Live Chat - PowWeb offers live chat which powered by a customized Java Applet. You can chat online with their support staffs on any issues including pre-sales questions. However, they currently support the live chat from Monday to Friday only. Weekend live chat will be supported in the near future. PowWeb FAQ - Here, you can search through PowWeb FAQ pages and find answers to many common asked questions in different categories. PowWeb Tutorials - PowWeb web-based tutorials provide easy to follow step-by-step guides from setting up basic features of your new account to configure Perl/CGI/PHP. PowWeb Community Forum - PowWeb has the largest and most active forum in the web hosting business. You can interact with over ten-thousands of PowWeb users for advice and get help from other members on various issues including pre-sales queries. As a California web site hosting company, PowWeb data center facilities are located at the Garland Building in downtown Los Angeles. The data center facilities ensure high security, redundancy and scalability. PowWeb uses Network Appliance's enhanced RAID4 technology for the file storage (hold up to 18 terabytes of disk space). Their servers are powered by DELL PowerEdge servers with 8GB of DDR memory. These speedy and robust servers ensure that your websites load quickly and available at all times. Moreover, these servers are connected to the Internet in Tier 1 backbone using BGP4 technology for best routing and redundancy. The high quality bandwidth with 2 Gigabit feeds are provided by InterNap and Verio. Most importantly, their server clusters use multiple "Foundry Load Balancing" switches designed for failover in the event of a load balancer fault. You can find out how the PowWeb's proprietary Load Balancing Technology that will ensure your website to experience zero downtime here!
" I have three packages at PowWeb and I am convinced that PowWeb is the fastest, best and cheapest of all the webhosters! Thank you PowWeb team! " " Your hosting has been great! I have been a member for a little over a year. With the new increased bandwidth and MySQL limits, I can't imagine hosting anywhere else. I have a friend who runs a computer store, and he has tried to sell me his hosting several times, but it costs more and they don't manage their server well at all. I plan on being a PowWeb customer for many years if your great values keep up, and I plan on suggesting powWeb to all my friends." Our only complaint with PowWeb is the poorly designed control panel that is not user friendly. If you're new to website administration, then you're going to be on a steep learning curve in setting up your website. Otherwise, PowWeb's One-Plan Package is still an ideal choice if your website requires huge disk space and attracts very high traffic. It's US$3.88 monthly fee (limited time promotion), unlimited disk space and bandwidth plus a free domain name come together to make One-Plan Package as one of the most affordable web hosting package in the market today. It's easy to see why we're tempted to recommend PowWeb the ideal web hosting choice!